Ezekiel prophesies to the land of Israel, that it will no longer be a grave for its former wicked possessors, but rather a place where the righteous remnant will return and “be fruitful and multiply.” Ezekiel looks forward to a period of many children born in the nation. 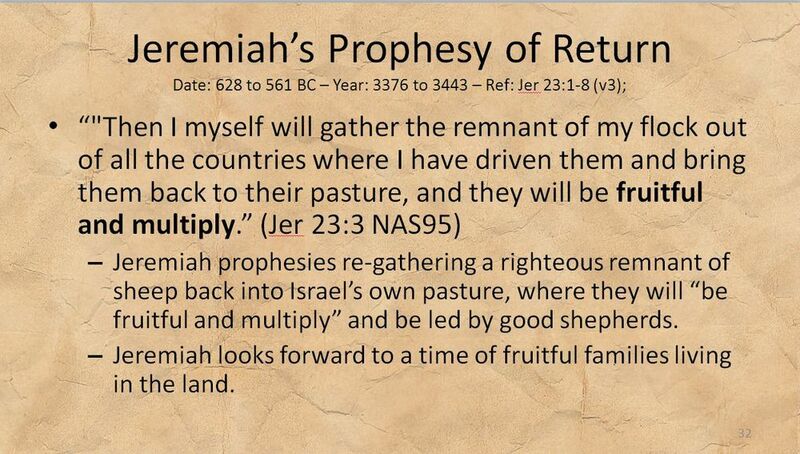 Jeremiah prophesies re-gathering a righteous remnant of sheep back into Israel’s own pasture, where they will “be fruitful and multiply” and be led by good shepherds. Jeremiah looks forward to a time of fruitful families living in the land! So, one can see that the command to be fruitful and multiply is not just some past, already fulfilled, no longer applicable command, bur rather something that still applies and the Lord still looks forward to. Roughly 3,400 years after creation, God tells His people through the prophet Jeremiah that there will come a day when the people won't simply look back at their miraculous delivery from Egypt, but instead look to their present regathering in their own land! Israel does eventually subdue and take the Promised Land of Canaan. Over many years the new nation of Israel moves through various governmental systems, a period of judges followed by monarchy. The monarchical period began with a United Kingdom, but through sin, devolved into a Divided Kingdom; the Northern half was called Israel with Samaria as its capital and Southern half was called Judah with Jerusalem as its capital. The Northern Kingdom was ruled by a continual succession of wicked kings and God allowed them to be conquered by pagan Assyria in 722 BC. The Southern Kingdom had several godly kings and God allowed them outlast the North by another 136 years. In that period, Babylon conquered Assyria and then Judah, the Southern Kingdom, in 586 BC. As Southern Kingdom of Judah was in the midst of falling and being taken away into captivity to live in Babylon, God instructed His people to build homes, plant gardens, marry, and have children; In the midst of such trying circumstances, God specifically commands them to be fruitful and multiply. In this great song of admiration, David extolls the excellence of the name of God. David surveys the majestic power of God in creation and His condescension towards man, celebrating the great love and kindness of God toward mankind, not only in man’s creation, but especially in his redemption by Jesus Christ. The Lord has ultimate dominion, but man was created in God’s image (Gen 1:26f) and for ongoing conformity to the image of Christ (Rom 8:29). Man was given dominion over God’s marvelous creation, which even little children acknowledge as truth (Matt 19:14; 21:15f)! Certainly, if man is to take dominion and “rule over the works of [God’s] hands” by having “all things under [man’s] feet” including land animals, birds and fish, he must have many children. Such fruitfulness is required for such a vast undertaking of stewardship. Interestingly, on the heels of the laws regulating divorce, Moses writes of another law regarding the first year of marriage. God prioritizes family over warfare. Men were prohibited from being drafted into military service, nor could they be assigned any travel duties the entire first year of marriage. The placement of this law is telling, in that divorce may be prevented by the faithful adherence to this law which narrowed a man’s focus on his wife, in a special way, in his first year of marriage. This also would naturally increase opportunities for the marital bond and thus serve to make it more probable that children would be born to the couple as early in marriage as possible. Such a law of exemption fostered healthy, happy, harmonious marriages and families; it afforded the opportunity for husband-wife affections to take a firm root; it enabled God to bless the couple with children. These provide strong guards against divorce. It is interesting that many Christians today put off having children, when God teaches the exact opposite. God is so concerned about the marital bond and fruitfulness in marriage that he writes it into law! One final note, modern Christians often wait until their children are grown and out of the house before they divorce. In this common cultural practice, we see that children can be a protection against divorce. God hates divorce. Christian couples need to work to put away sin, fulfill their God-given roles, and strengthen their marriages. It is never too late to follow God’s law, and seek to implement His principles. God’s law is wise and for our good. So, in this case, God's command is in the form of a promise. Cultivating the command yields the fruit of the promise. The Lord will drive out Canaan’s inhabitants gradually as the Israelites fruitfully multiply to fill the land and take dominion and fully possess the formerly pagan region. About two years into the great worldwide famine, at Joseph’s request, his father Jacob’s family came to Egypt to live there. It would appear that this promise was already being fulfilled during the 17 years that Jacob lived in Egypt prior to his death, or at least Jacob began to see an encouraging fruitfulness among his own children, grand-children, and great grand-children. Considering that Jacob is Abraham’s grandson, this is roughly 200 years after the promise was given to Abraham. God promises to preserve and deliver His people in a mighty way. After Joseph died, the young people group now known by Jacob’s new name Israel (Gen 32:28), continued to multiply, which caused Pharaoh grave concern. So, we see that Israel’s faithfulness to the promise of God regarding fruitfulness is leading to an explosion in the population of nascent Israel. This is the Abrahamic promise of “nation”. In Jacob’s dream of the ladder to heaven at Luz, he was promised to be fruitful and numerous. Jacob remember this promise many years later in the final days of his life as he passes on the blessing to Joseph’s sons (Jacob’s grandsons and Abraham’s 2nd great grandsons) by adopting them into his family as eventual tribes of Israel. Jacob again recalls the blessing. God’s promise to Abraham included 3 aspects: (1) land, (2) nation, and (3) blessing. At the time, the first two applied primarily to the future nation of Israel and its borders. The third extended beyond Israel’s borders, providing benefits to “all the families of the earth.” (Gen 21:3) through Abraham’s “Seed” – the Lord Jesus Christ. God had also promised to Abraham a multi-generational fruitfulness that would carry on throughout all of history. At the heart of these three promises is fruitfulness. In a very practical way, the population increase is the driving force which enables Israel’s future greatness. It enables the land of Canaan to be subdued; it enables Israel to establish itself as a great nation; it enables him, through his offspring, to be a blessing to the nations through the ages. After the Great Flood, the Lord re-iterates the Dominion Mandate. This is important because Noah, and those of later generations, might have been inclined to think that God was finished with mankind. God saw man’s unrestrained wickedness, expressed grief over his perpetual sin, and determined to destroy them. But, this restatement of the Dominion Mandate indicated that there was still a future for man in God’s eyes. Also, it is clear enough that Noah himself followed the Dominion Mandate in that he literally ruled over just about the entire world – animals, birds, and plants brought onto the ark; he was also the head of his household, who were saved on account of his righteousness. Noah was a “preacher of righteousness” (2Pet 2:5) and an “heir” of what he preached (Heb 11:7). Some say that the “be fruitful and multiply” command was given only to Noah and his sons. That wouldn’t make much sense, since Shem, Ham and Japheth could only have so many children. So, the “fill the earth” command would obviously need to go on for many generations. Also, most Christians today eat meat and many are for capital punishment. It is inconsistent to say that the “be fruitful and multiply” command, which appears twice, need not apply today while holding on to the other commands.